Cordoba Cordoba: See the 2,000-year-old Roman bridge and spend some time exploring the town. DAY 2 - WELCOME TO BARCELONA. DAY 3 - BARCELONA, THE CITY OF GAUDI. DAY 4 - ALONG THE ORANGE BLOSSOM COAST TO VALENCIA. DAY 5 - FOLLOW THE SIERRA NEVADA TO GRANADA. 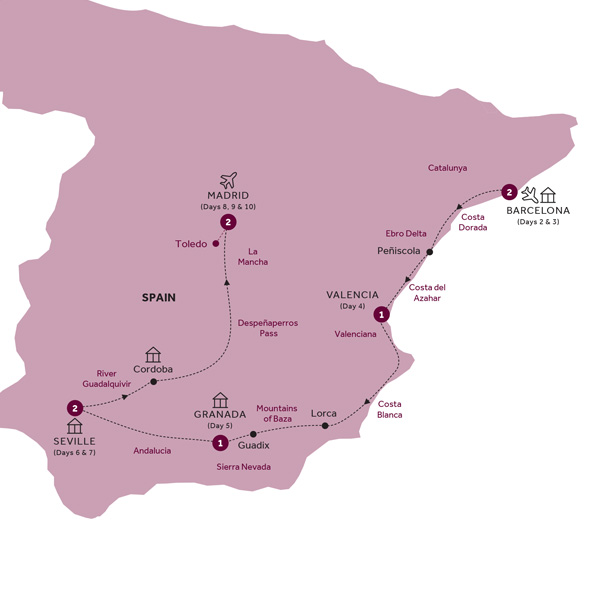 DAY 6 - EXPLORE THE ALHAMBRA AND A SCENIC DRIVE TO SEVILLE. DAY 7 - SEVILLE, THE CITY OF CARMEN. DAY 8 - MOORISH CORDOBA AND ON TO MADRID. DAY 9 - MADRID OF THE BOURBONS. DAY 10 - FAREWELL MADRID.